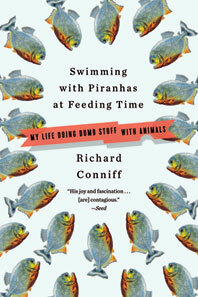 Richard Conniff is a contributing opinion writer for The New York Times and a popular author specializing in human and animal behaviors. He has collected tarantulas in the Peruvian Amazon, tracked leopards with !Kung San hunters in the Namibian desert, climbed the Mountains of the Moon in western Uganda, and trekked through the Himalayas of Bhutan in pursuit of tigers and the mythical migur. 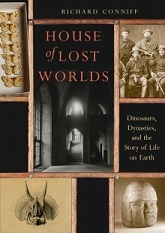 His latest book is House of Lost Worlds: Dinosaurs, Dynasties, and The Story of Life on Earth, (Yale 2016). He is a National Magazine Award-winning writer for Smithsonian, The Atlantic, National Geographic, and other publications, a 2007 Guggenheim Fellow, and a 2009 winner of the Gerald Loeb Award for Distinguished Business and Financial Journalism. 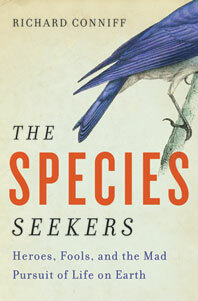 His other books include The Species Seekers: Heroes, Fools, and the Mad Pursuit of Life on Earth (Norton 2010), Swimming with Piranhas at Feeding Time: My Life Doing Dumb Stuff with Animals (Norton 2009), The Ape in the Corner Office (Crown 2006), The Natural History of the Rich (Norton 2002), and Spineless Wonders: Strange Tales of the Invertebrate World (Holt, 1996). He has been a frequent commentator on NPR’s Marketplace, and has written and presented television shows for the National Geographic Channel, TBS, and the BBC, among others. Fascinating! Jane Goodall will be honored, and speak at the Harvard Museum of Natural History in Cambridge, on Sunday, March 18th, 2007. I’ll be eager to hear her reaction to this paper. in which you mentioned some of my thoughts from my book ‘The mating mind’. which is being published May 14 by Viking. I think you’d find it very amusing. I have followed and enjoyed your writing and have grabbed the opportunity of seeing your article in the Times today to see if this last name that we share, which I don’t see very often, has some common, no doubt very distant, connection. My grandfather’s name was James Conniff and he was, also, a pretty cruty Irishman who raised his family (including my father, Dutch Conniff) first in Vermont and then in Springfield, MA. I currently live in Napa Valley and work for The Culinary Institute of America as a writer and marketing manager. So if you have a few spare moments, I’d love to hear back from you. Hi Richard~~Just read ‘Piranhas’ and uh, devoured it. I am not the least bit scientific, only went as far as Bio 101 in college, but I love your way of making the information in the book so interesting. You’ve got a reader for life–now I’ve got to read the rest of your books, and also your columns and blogs. Thanks for sharing your gift with us. PS–Ever get out to the great midwest? We’re in landlocked Kansas City, and if you are speaking within a reasonable distance, we’d love to hear your presentation. Is “collecting behaviors” a communicable disease? Hi, just came across your blog and its full of fascinating stuff. I especially enjoyed the post about bullet ants–I’ve tried to describe the pain to people who just think I’m a whiner, so I appreciate reading that it’s a 4. I will have to make a habit of checking out your blog for more interesting info. And I just started a blog that should have some fun primate behavior topics, so check it out if you get a chance. I edit http://www.onlineopinion.com.au, Australia’s leading e-journal of current affairs, social and political debate. Our population is increasing and with it comes some decision making about our land. Can we afford to have land locked up in national and state parks? Can we afford the luxury of wilderness? Or should we be looking at ways to use this land sustainably? We have deliberately kept the topic broad as we want to publish a variety of articles. I was wondering if you or someone from your organisation would be interested in contributing something. Articles need to be written in a newspaper opinion style, therefore we don’t need references but links are fine. They should be between 800 and 2,000 words. I will also require a short biography for you to go with it. The feature kicks off on Monday, March 1. We can be very flexible with the deadline as we will be publishing articles throughout the month, but obviously the sooner we get them in the better. It is probably best to liaise with me on the timing. Can you let me know of you are interested in doing something? Sending this via a form sent me off my guard! It should, of course, have read Dear Richard!!! 🙂 Please forgive me! I am creating an anthology for The Animal Anthology Project (which benefits animal shelters and wildlife organizations), and was wondering if you could contribute to it. If you wrote a short piece for the anthology it would help so much. You could send in a short non-fiction piece about one of your animal experiences, or you could write an opinion piece. It could be basically any length- probably between 250 and 3500 words. Thanks so much for considering this. I absolutely love your book, Swimming with Piranhas at Feeding Time. This is a fantastic idea to honor so many unsung heroes. Browsing through the wall, I found an error that I would like to see corrected. I was a close friend of Michael Alberico, and therefore was surprised to see that you mention that he was killed when 68 years old. We used to work together for many years and I know he was 9 years older than me, so I think you got his birth date wrong. Since I was born in 1957, the correct date should be 1948. I just realized there is another important colombian naturalist missing in the wall. Henry von Prahl was a pioneer marine biologist in Colombia. Born in Germany in 1948, he arrived in Colombia when 5 years old and therefore considered himself a native of the country. Internationally acknowledged as an expert on marine crustaceans, mangroves and coral reefs. Henry was killed when the plane in which he was traveling from Bogota to Cali was destroyed by a bomb on November 27, 1989. Pablo Escobar of the Medellín drug cartel planned the bombing, hoping it would kill presidential candidate for the 1990 elections César Gaviria Trujillo.